This is part three of a series based on interviews with Iranian Foreign Minister Mohammad Javad Zarif, a one-on-one interview with Robin Wright and another with a group of American journalists (including Wright) on July 18 in New York City. 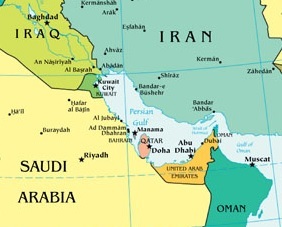 The following are excerpted remarks on tensions in the Persian Gulf. The ones [neighbors] who want to cut the snake's head and the other ones who have been pushing for it for a very long time. So, I think there is a marriage of convenience between these two neighbors. One neighbor and one not so much as a neighbor, but the point is that Iran is not... this is not new for Iran. The difference between Iran and U.S. allies in the region, and I think it would be best for the United States to recognize that, is that U.S. allies in the region would start differing with the United States just, even pretend that its walking away or have a perception that its walking away from them. You remember what happened in Camp David last year [when President Obama met with GCC leaders]. You remember the type of anxiety that was brought to bed, and that was manifested in Camp David and before Camp David. Iran has lived, prospered, made progress in spite of the United States' pressure. And I think sometimes that is very difficult for some in the United States to recognize. I mean they make just comments which would lead them to wrong policy. We have a joke in Farsi that somebody started shouting that at the end of the ally there is a soup kitchen, and they are distributing soup. Good soup. So, people picked up their whatever bowls and everything trying to get this charity soup. And there was a big line. And then the guy takes his own bowl and stands at the end of the line saying, "Well all of these people are not wrong. Somebody is distributing soup." Today, I mean during the [presidential] campaign, both Saudi Arabia and other countries in the Persian Gulf were the biggest supporters of extremism and terrorism, and now they are the biggest allies against extremism and terrorism. And the only thing that has happened has been hundreds of billions of dollars bought of beautiful military equipment. So, these are the yardsticks that the United States uses in order to determine who is supporting terrorists, who is violating human rights and who is not. Question: How firm do you think Washington’s support is right now for Abu Dhabi and Riyadh, and secondly, on the Qatar situation, the President says one thing, [Secretary of State] Rex Tillerson seems to be doing another. How do you see that and are you concerned about the fact that the U.S. government seems to not be on the same page? Zarif: Well, again, I do not want to dictate to other governments how to run their foreign policy, but I think it is much wiser and much more stable if you rely on your own people rather than rely on foreign governments for your security. And I think people will find it to be much more rewarding if they are not dependent on external forces. Believe me, we have. Because we experienced the other scenario for some decades, and now we feel it is much better, to be able, not to not care, but to depend on something that we own, and not from the outside. Question: How do you see the Qatar situation? Zarif: And now with regard to Qatar, I believe signals are very important, and wrong signals can be very dangerous. I think we all remember the episodes in the early 1990’s and mid-1990’s with Iraq and Yugoslavia where wrong signals were sent, and disastrous policies followed. I think wrong signals have been sent to our neighbors, and I’m very happy that we averted a disaster in the region. And I hope that our neighbors will learn, to again, understand the reality of geography, that people from outside cannot change the geography of our region, and we need to be talking to each other, rather than to be talking to outsiders about each other in order to resolve our differences. Iran is certainly ready to engage with others and I hope our neighbors first engage with each other and resolve their differences and then they will find Iran ready to engage them. Click here for Zarif's comments on the Syrian conflict and chemical weapons.